MSSS's Mike Ravine, the MARCI/CTX Instrument Manager, taking the picture. The Mars Color Imager (MARCI) is designed to acquire daily global images of Mars for at least 1 martian year (687 Earth days) at 5 visible wavelengths and 2 ultraviolet wavelengths. MARCI images will be used to document the weather on Mars by observing the comings and goings of dust storms, polar frost, and clouds of water vapor, water ice, and carbon dioxide crystals. MARCI's ultraviolet observations will map the distribution of water vapor and ozone in the atmosphere. 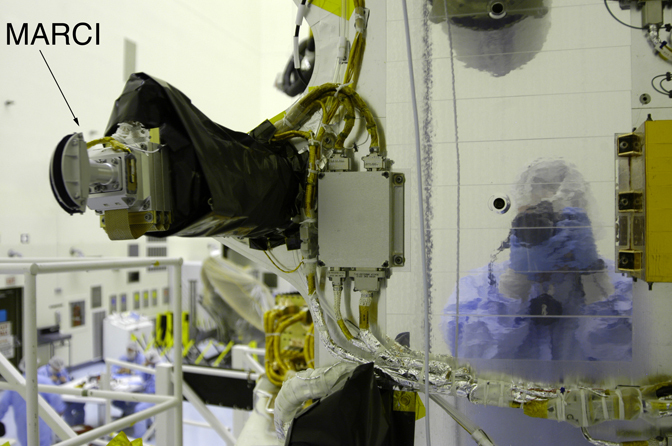 The MRO MARCI is the second such camera to be sent to Mars. The first was competively selected by NASA to fly on the Mars Climate Orbiter (MCO) in 1998. That spacecraft was lost during orbit insertion in September 1999. The MCO MARCI had two cameras-- a wide angle system to provide daily global views of the planet, and a medium angle system to provide 40 meters per pixel views of selected areas to be examined for landing site studies. For the 2005 MRO mission, NASA decided only to re-fly the MARCI wide angle system, and replace the 40 meters per pixel medium angle camera with the 6 meters per pixel Context Camera (CTX). On each orbit that MRO makes around Mars, MARCI simultaneously acquires 7 pictures at 7 different wavelengths. Over the course of a day, MRO makes 12 to nearly 13 orbits around Mars. The 12 times 7 pictures per day (84 images) provide a daily record of meteorologic events that have occurred on the planet. By building up these images every day for an entire martian year, MARCI will provide a record that spans through winter, spring, summer, and autumn in both martian hemispheres. The table, below, shows the wavelengths of each MARCI image. In addition to their utility in observing ozone and discriminating between clouds of dust, water vapor, water ice, and carbon dioxide, these images can also track the changes in brightness of the martian surface, monitor the growth and retreat of the polar caps, and aid in identification of iron-bearing minerals. Looking straight down (nadir orientation) at Mars, MARCI images are designed to have spatial resolutions in the 1 to 10 kilometers per pixel range. The system consists of two separate sets of lenses and detectors--one for the visible light images, and one for the ultraviolet images. Both systems have a 180° field of view lens, which permits all of Mars to be in view, even when MRO rolls up to 20° off nadir for imaging specific targets with its other instruments. Each MARCI image is about 1000 pixels wide and can be many thousands of pixels long, depending on the objective of the image. The figure (above) shows a representation of the MARCI visible (color) detector. A single CCD array is used. The five color filters are bonded to the detector in strips as shown here. The blue strip represents the 423 nanometers band, the green is the 550 nanometers band, and so forth. As MARCI moves forward in its orbit around Mars, it will build up color images using the 5 visible light filters as each fitered area of the CCD detector passes over the martian surface. This animated GIF (above) shows a simulation of the motion of the MARCI detectors across Mars, but in this case it is a scan of an array of colored rock targets imaged by MARCI in a laboratory at Malin Space Science Systems. This same color rock target was used to calibrate the Pancam color cameras on the Mars Exploration Rovers (MER) and was loaned to the MARCI team by Richard Morris of the NASA Johnson Space Center. This final figure (above) shows a color composite of the color rock target imaged by MARCI in the lab at MSSS. This is put together by mosacing each thin, narrow image viewed by each MARCI color detector as it passed through the field of view. In this case, the image shows a calibrated composite from MARCI bands at 600 nanometers (nm; red), 550 nm (green), and 423 nm (blue). The MARCI ultraviolet filters operate in a similar manner. © 2005 by Malin Space Science Systems, Inc.